In every home, there always seems to be at least one room that's always too hot or too cold. Regulating the temperature in that room is now substantially easier with the Room-to-Room Fan, a two-speed, in-wall ventilation system that moves heated or cooled air between rooms. This built-in solution is ideal for balancing room temperatures for maximum comfort, even in parts of the house that aren't getting their fair share of heat or cool air, like garages, enclosed patios, workshops or add-ons. 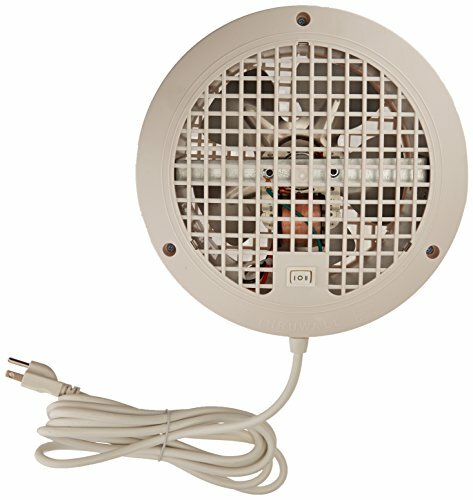 The Room-to-Room Fan is built with a telescoping feature that allows it to accommodate any normal drywall or paneled stud construction wall from 3.5\" to 6.5\" thick. The air discharge is on the cord/switch side (one-way air flow). The fan tube diameter is approximately 8\". Grille diameter is approximately 9.75\". Weight: 5 lbs. Power is provided through a 10-ft. power cord with a grounded plug (use of extension cords is not recommended). The Room-to-Room Fan has a High-/Low-Speed rocker switch, with a Center Off position. At high speed, it moves about 110 cubic feet of air per minute (CFM) and uses 60 watts. At low speeds, it moves about 60 cubic feet of air per minute (CFM) and uses 50 watts. Sound levels are 51dB on high speed and 49dB at low speed about that of a desktop computer fan. The Room-to-Room Fan has been rigorously tested to ANSI/UL Standard 507, and is ETL Listed. The housing is made of galvanized sheet metal, with grilles made from high-impact, flame-retardant ABS. The electric motor is a Class B, thermally-protected motor. If you have any questions about this product by Suncourt, contact us by completing and submitting the form below. If you are looking for a specif part number, please include it with your message.